H elena Coming back on the grid for a day, you go through your email, answer the urgent calls, see what’s tweeting, hit the Facebook, and scan through the headlines in the New York Times and other papers to see what’s up. The last is the least rewarding task sometimes. An irresistible headline jumps up on an editorial: “A Welfare Check and a Voting Card.” That’s a verse in my song, so I jump to that. Big mistake! The good news is that the Obama Administration after delays dating virtually back to the passage of the National Voter Registration Action (NVRA) in 1993 is clearly issuing regulations to the states and making mandatory the so-called “motor voter” provisions that would require registration access and assistance for recipients of welfare and food stamps by government workers who work with these eligible families. That indeed is cause for celebration by all who are committed to democracy, full participation of the poor in what I have called “maximum eligible participation,” and, frankly, just plain following the law. The Times editorialist was both wrongheaded and mean-spirited. In the second sentence comes the first backhanded slap: “…but it could also reduce the impact of advocacy organizations whose role in registering voters caused such a furor in 2008.” WTF? Buddy, you want to reduce the impact of groups committed to full democratic participation by all Americans, then stand up with the Times for automatic registration or even better mandatory voting, don’t blame those of us committed to democracy for the fact that the government didn’t do what the law both allowed and required. Jerk-ball! But, it gets worse. Later the editorialist offers this gem: “But it is worth remembering that the recession has brought millions of new people to food stamp and other welfare offices in the last two years, many of whom may not be traditional Democrats. In addition, government offices are much more likely to provide reliable registrations than Acorn (sic ACORN) or other advocacy groups that were widely accused of fraudulent sign-ups in the last cycle. 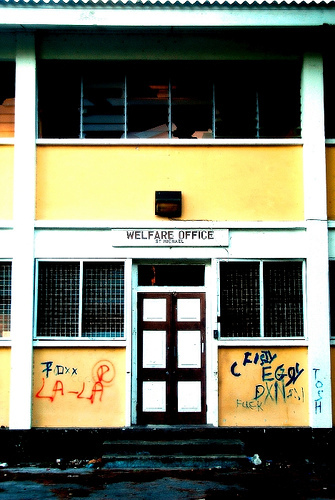 Welfare offices generally have extensive methods of verifying identities in order to provide benefits, and it is illegal to provide false records there.